Senator the Hon. Kate Lundy, Parliamentary Secretary to the Prime Minister, Parliamentary Secretary for Immigration and Multicultural Affairs, gave the keynote address at the launch of The Salvation Army’s 2011 Red Shield Appeal to ethnic communities today in Sydney. In her address, Senator Lundy gave special mention to the various representatives of the ethnic media that attended, respected community leaders, presenters and organisers of the event; Mr. Joseph Assaf – who incidentally has been personally supporting this important initiative for over 15 years – and Multicall Pty Ltd. This year, the launch event was held at one of Sydney’s most picturesque settings, in one of the private function rooms of Le Montage – just one of the five-star venues operated by the Navarra Group. This was offered as a gesture of great generosity and support by the family and management of the Navarra Group. The national target for this year’s Red Shield Appeal is $79 million. The doorknock, which is a major part of the campaign, will be held on the weekend of 28-29 May. Salvation Army Appeals Director, Major Jeff Winterburn said: “The Red Shield Appeal is vital in helping to fund The Salvation Army’s wide range of social programs across Australia. “The demand for our services is only increasing, with many disadvantaged families being impacted by the rising cost of living. “Furthermore, an unprecedented run of natural disasters this year has placed a tremendous demand upon Salvation Army services. “Meanwhile, each day, many Australians face personal disasters such as homelessness, financial hardship, violence in the family, suicide bereavement and unemployment. We’re asking the Australian community to again give generously in support of the Red Shield Appeal so we can keep supporting those who face such daily challenges,” said Major Winterburn. Joseph Assaf spoke about how ``every year The Salvation Army helps more than one million people. Last year, more than 6,000 people were assisted by The Salvation Army’s migrant and refugee services”. He urged the community and media leaders “to spread the message and invite the communities to support this good work”. The Salvation Army, as part of the Universal Christian Church, aims to meet human need wherever it occurs, without discrimination. Services specifically catering towards the needs of migrants or people of non-English speaking background include English conversation classes, seniors clubs, job placement services, refugee support including reuniting and advocacy services. 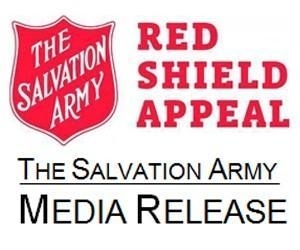 To give to the Red Shield Appeal, please call 13 SALVOS (13 725 867), visit salvos.org.au, donate at any Westpac branch, or post your cheque to PO Box 9888 in your capital city.